Look up the National League’s batting average leaders and Michael Morse’s name appears third behind perennial All-Stars Jose Reyes and Ryan Braun. Morse is behind only Lance Berkman, Braun and Matt Kemp in slugging percentage. The Washington Nationals’ first baseman/left fielder is in the top 15 in the National League in both home runs and runs batted in, and is in the top ten in OPS. 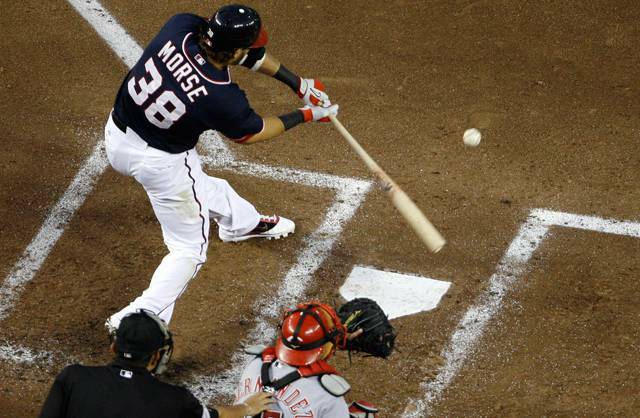 Michael Morse never had more than 266 at-bats in a season. From 2005 through 2010, he appeared in only 237 games, batting .291/.353/.456 with 33 doubles, 21 home runs and 88 RBIs, which is an average of 15 homers and 61 RBIs over 162 games. Not discouraged by his lack of experience, the Nationals penciled the 6’5″, 230-pounder into the Opening Day lineup in left field. Washington expected Morse, along with Jayson Werth, to help make up for the offseason losses of Josh Willingham (traded to Oakland) and Adam Dunn (signed with the Chicago White Sox). It took him a while to adjust to his new role, but Morse has responded by becoming one of the best hitters not only the in the Nationals’ lineup, but in all of baseball. An everyday player for the first time in his career, Morse started off the season just 2-for-20. It took him 12 games before he had a multi-hit performance. Batting in the middle of the lineup, Morse didn’t hit his first home run until April 24, the same day he had his first multi-RBI day. In 23 games during March and April, Morse batted .211/.253/.268 with just one double, one home run and nine RBIs. Washington’s gamble that the physical specimen Morse would hit now that he was finally given consistent playing time in the majors was not looking like it would pay off. Morse slipped into a platoon role with Laynce Nix. 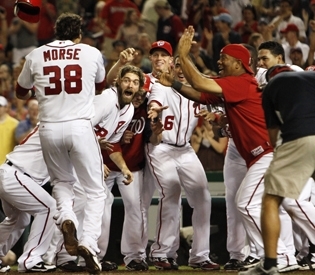 However, as soon as the calender turned to May, Morse suddenly morphed into a different hitter. During one stretch in May, he hit a home run in four consecutive games. In 85 games from May through August, Morse has batted .349/.400/.635 with 28 doubles, 20 home runs and 62 RBIs, which over a 162-game average, translated to 54 doubles, 39 homers and 119 RBIs. With Adam LaRoche out of the season with an injury, Werth struggling mightily and Ryan Zimmerman finally starting to come into form after an early-season injury that caused him to miss 58 games, it has been Morse who has shed the platoon role to become in Washington’s lineup and carried the Nationals’ offense. It looks like it could be the way for the foreseeable future. The Nationals have never had a winning season since they moved to Washington, D.C. before the 2005 season. However, with Morse, Zimmerman and hopefully a rebound performance by Werth next season, Washington has some pieces in the lineup they can build around with their wealth of young talent. Twenty-three year old Wilson Ramos has done a solid job in his rookie season behind the plate. Up the middle, the Nationals have two young pieces in second baseman Danny Espinosa and shortstop Ian Desmond, although both have had their share of struggles this season. Top prospects Bryce Harper, Anthony Rendon and Chris Marrero also figure to reach the majors in the near future. Combined with Washington’s young pitching nucleus that consists of Stephen Strasburg, Jordan Zimmermann, John Lannan, Drew Storen, Tyler Clippard and Henry Rodriguez, the Washington Nationals look to have a very bright future. The Nationals placed a lot of responsibility on Michael Morse at the beginning of the season by asking him to help fill the shoes of Adam Dunn and Josh Willingham. Initially, Morse struggled with the pressures of being an everyday player for the first time in his major league career. However, he has settled down at the plate to carry Washington’s offense for most of the season and become one of the National League’s best hitters. At 29 years old and finally given the first opportunity of his career, Michael Morse has made the most of it, becoming a bat the Nationals can build around with their young talent to finally build a winner in D.C. This entry was posted on August 17, 2011 by Scott Kornberg. It was filed under Michael Morse, Washington Nationals and was tagged with Anthony Rendon, Bryce Harper, Chris Marrero, Danny Espinosa, Drew Storen, Henry Rodriguez, Ian Desmond, Jayson Werth, John Lannan, Jordan Zimmermann, Laynce Nix, Michael Morse, Morse, nationals, Ryan Zimmerman, Scott Kornberg, Stephen Strasburg, Tyler Clippard, Washington Nationals, Wilson Ramos.